Last month, the North American Wetlands Conservation Council selected four projects within the PLJV region to receive North American Wetlands Conservation Act (NAWCA) small grants. Together, these four projects will provide over $376,000 in federal funds and another $431,000 in matching funds to support long-term wetland acquisition, restoration, and enhancement of more than 1,200 acres, benefiting many species of migratory birds and other wildlife. The first project of the Clovis/Curry County Ogallala effort will be to restore several playas using match from a city-purchased playa and playa leases from previous conservation efforts in Curry County. The objective of the partnership is to conserve playas and bring them to as natural a state as possible to provide maximum recharge to the Ogallala aquifer, which is currently the only source of water for the city, most county residents, and nearby Cannon Air Force Base. This implementation phase will begin by removing sediment and/or filling pits from four playas, three of which are city-owned and already surrounded by a grass buffer and one that will be restored from cropland to native range. This project represents the next phase in an ongoing effort to restore and perpetually protect vital wetland habitat in this continentally important landscape. With this grant, an additional 145 acres of North Platte River frontage will be perpetually protected. 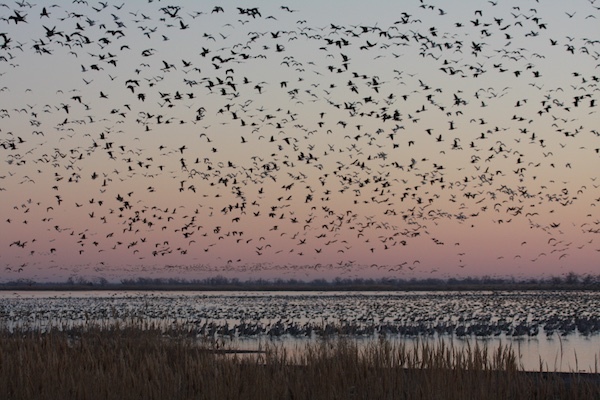 Wetlands associated with the North Platte River provide critical habitat to millions of migratory birds. Hundreds of thousands of migratory waterfowl use these riverine habitats as loafing, roosting and feeding areas extensively during migration and wintering periods. The vast majority of habitat along the North Platte River in this region is privately owned and subject to development pressures and other activities that result in lost or degraded habitat. One of the main goals of ongoing conservation activities in this region is to protect remaining habitat through fee-title acquisition or securing conservation easements. An additional 220 acres of North Platte River accretion ground will be perpetually protected with this grant. The project showcases how working with numerous landowners in close proximity can make a real landscape level impact. To date, this partnership has protected over 7,000 acres along the North Platte River in Scotts Bluff County, Nebraska. Thousands of these acres were made possible through previous NAWCA grants delivery. This project represents the next phase in habitat protection along the North Platte River that is truly having a landscape level impact. The habitat that this partnership has been able to protect over the past 15 years will be available to waterfowl and other wildlife in perpetuity. This project will restore at least 545 acres of emergent and riparian wetlands and 943 acres of upland prairie through voluntary projects on private lands. Left uncontrolled, non-native invasive phreatophytes have a variety of deleterious effects which reduce the quality and quantity of migratory bird habitat within the Rattlesnake Creek basin and reduce water inflows, originating on private lands, to Quivira National Wildlife Refuge (NWR). Mitigating the impacts of reduced water supply is challenging due to social, economic, and legal complexities associated with water rights; however, U.S. Fish and Wildlife Service, Groundwater Management District 5 and others have been working with water users to address water related issues in this basin, and invasive tree infestations are a common concern. Photo credit: Quivira NWR by USFWS.